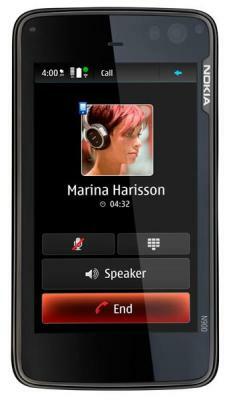 Nokia announced its first Maemo based phone- N900. It is not a “normal” N series phone, but a monster in itself. The device boasts an ARM Cortex A8 that provides 1GB of application memory and Open GL ES 2.0 Graphics acceleration support, which means that it is one powerful phone. The OS is Linux based Maemo 5 that gives the device comprehensive multitasking support. The UI is much better than the traditional nokia interface and might even challenge iPhone UI. Nokia N900 has WVGA touchscreen and a full, slide out QWERTY keyboard. It has a 5 MP camera with 32 GB of internal memory expandable upto 48 GB. Also, Nokia N900 will have the mozilla based browser named fennec, which will further enhance the browsing experience. It will support Adobe Flash 9.2.It also has HSPA Bluetooth and Wi-Fi connectivity. Nokia N900 will be available in October 2009 with a price tag of EUR 500. In India, the price would be around Rs 35000.
when will this be available in India? No words about that! We'll post it once it becomes available.